Burgums and Burghams from the "WW" family tree lived here, or nearby. BILSTON ST LEONARD'S CHURCH There was a chapel here in 1090 but, in 1458, it was replaced by St Leonard's Chantry. Following renovations a third church on the site was consecrated in 1733. Another rebuilding in 1825-26 became the fourth church on the site. The church, built in the neo-classical style, is impressive due to its modern appearance and is whitewashed outside and inside, resulting in its' neat and clean appearance. It has an unusual chamfered square tower, giving it an octagonal appearance, and is surmounted with a cupola. On top is also a golden globe and weather vane, together with a fenced viewing platform. These create an unusual but pleasing appearance for an English Church. It was the growth in industrial activity that attracted Burgums/Burghams to Bilston. The first blast furnaces were ercted in 1780, following the construction of the Birmingham Canal ten years earlier. Factories and coal mines grew rapidly, quickly followed by the housing to accommodate the workers. Bilston Steel Works owned five of the six blast furnaces in the area, which produced close to 25,000 tons of steel each year. The industry continued until the 1970's when the Labour government closed it down. From the 1920's and 1930's a program was begun to demolish and replace much of sub-standard housing in the area. This program continued for decades, building on inactive industrial sites and closed coalfields. The Burgums and Burghams lived mostly in an area of Bilston called Hallfields. BILSTON ST MARY'S CHURCH The architect who designed Bilston St Leonards, Francis Goodwin, also designed Bilston St Mary's (Church of England) sited on Oxford Street. It was built in 1829-30.after St Leonard's in a Gothic Revival style. It was funded by the local Church Commissioners as the Government sought to build 600 new churches to accommodate the needs of the rapidly growing industrial population. The church, sometimes described as being built back-to-front, is most odd. Unusually, for example, the tower has been built at the east end of the church. The main entrance is on the west end, as you would expect, but that is not necessary obvious. It is also odd that the stained glass window above the west entrance appears inside out. Instead of being read from inside the church the text has been designed to be read from the outside. Other churches and chapels relevant to Burgum/Burgham family and the main cemetery and briefly described below. 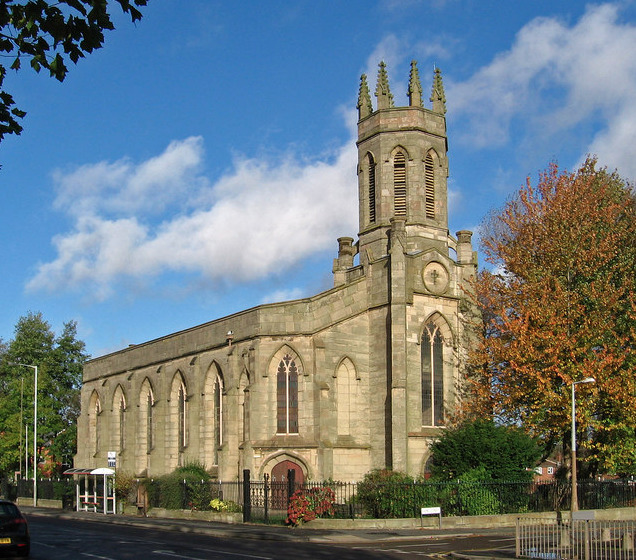 Bilson St Luke was built of stone in Market Street in 1852. It was constructed in the Early English style with a chancel, nave, aisles and south porch with a south-side tower with an octagonal spire on top. The spire was removed in 1934 after becoming unsafe. The church was closed in 1969 and finally demolished in 1973. Swan Bank Weslian Chapel was first built in 1823 and There has been a chapel on the ‘Swan Bank site since 1823 and was the first building in Bilston to be lit by gas. The chapel was extended in 1840 and in 1890 it was enlarged to seat 1,000 people. It was demolished in 1969. The Bilston Cemetery in Cemetery Lane, later Cemetery Street, had its' foundation stone laid on 2nd May 1854 and the grounds were opened for burials on 9th March 1855. The cemetery covers an area of over 9 acres and the total cost in 1854 was about £5,000. The cemetery chapel, which no longer stands, was built of the best blue bricks and the grounds were said to have been tastefully laid out. However much of the land was spoil from the coal pits and tress and plants initially struggled to survive. Bradley Wesleyan Chapel is included here for completeness as it is in the Bilston East ward, being a small village before the industrial revolution. The list below shows the baptisms, marriages and burials that took place at Bilston. Henry Burgsom 05 Apr 1837 Swan Bank Wes. Burial Age 4m. Mary Burgam 24 Mar 1839 Swan Bank Wes. Burial Age 53 or 63? Mary Burgwin 23 Apr 1854 Swan Bank Wes. Burial Age 9m.